It's not so long ago that Newport's merchants were providing goods through a wide variety of skills, trades and equipment. It was a far cry from today's streets, where most activity is limited to processing plastic. Nothing substantial remains to reflect that past but occasionally somebody queries a minor item that has escaped the purge, and we're reminded of a different town. In the first half of the 20th century, many of Newport's streets would have been rich with the smell of coal, fuel, tar, beeswax and metal polish. In the absence of a Museum of Olfaction, little remains as a reminder of such times. Nevertheless recent attention has been drawn to an oddity just off the road in Pyle Street, which, on examination, turns out to be typical of the period. The equipment is a paraffin pump, still in place in what was presumably once the forecourt of a garage or hardware store. It has a wind-up mechanism and can be set to deliver one or half gallon. The cylinder on the right delivered the fuel, while the one on the left purified it. The only paraffin available in those days was of a raw nature and rather dirty. In the home this would give rise to smoking lamps and heaters. There were a number of attempts to purify paraffin at the point of delivery. This one was patented in America around 1880, although the pump will be of a later date. It is somewhat surprising this small reminder has survived, and there's probably no demand to formally conserve it. Had it delivered water it would be a revered 'parish pump'. Paraffin doesn't have quite the same cachet. In our May news item we reported that the Home Office had lost the declassified file on Sandown WW2 spy, Dorothy O'Grady. We concluded the article by saying a Freedom of Information application had been placed with the Home Office seeking any memoranda referring to the file, albeit not expected to reveal much. In the event, the reaction of the Home Office to this application has merely added to the mystery surrounding Dorothy O'Grady. The Freedom of Information application not only requested copies of any internal correspondence relating to the file, but also the reason the file had been called up from National Archives and the names of personnel who handled it. As no member of the public appears to have seen the documents, it was hoped an official at the Home Office might be able to recall some detail from memory. There was some delay in the Home Office acknowledging the application but they eventually did so with the standard obligation to supply the information within 20 working days, by May 20th. However, a week later they issued another acknowledgement, this time saying they had invoked section 10(3) of the FOI Act, entitling them to extend their deadline in order to consider whether it was in the public interest to release the information. This was a surprising reaction. After all, the Dorothy O'Grady file had been declassified and briefly available at the National Archives, thus, by definition, the subject had already been established as being in the public interest. They set a new deadline saying "We now aim to send you a substantive response by 16 June." In fact no response has ever been received. Repeated emails seeking an explanation have not met with a single reply. It is as if the FOI application had never been made. It's difficult to imagine how this situation can arise. It would be a remarkable coincidence if an application querying a lost file had itself been lost, along with the officials dealing with it. Or did they assume that, by doing nothing, the enquiry would simply go away? Is there another dimension to the Dorothy O'Grady story? Why did the Home Office recall this file when it had already been declassified? The next step in such situations is to apply for a Home Office 'Internal Review'. This department has now agreed to a review the matter, although their letter is ominously couched in familiar terminology, promising a response within 20 working days. The Isle of Wight Coastal Audit of 1999-2000 identified numerous sites of archaeological interest. Unfortunately many features consisted of intertidal formations of timber stakes that couldn't be dated. Moreover, these undated sites were among the most critical in charting human exploitation of the coast, and now the most vulnerable to rising sea levels. It was therefore decided to carry out a carbon dating programme covering selected sites while the opportunity still existed. Many of us will have seen old timbers protruding from waterlogged ground around our coastline and been curious as to how old they are, perhaps assuming an expert eye could advise. In fact it's rare for there to be any visible dating evidence. Such features could be anything from prehistoric to Victorian. In recent months carbon dating results have been coming in, covering a range of Island sites. Archaeologists have been surprised at how old many of these features are. 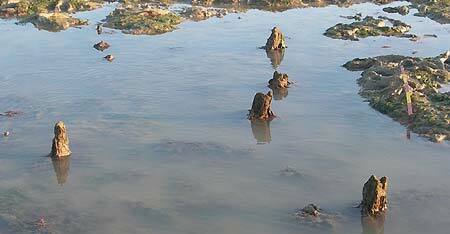 Some of the earliest stake alignments were off Newtown East Spit. Two of these, one running longshore, were dated to around 2300 BC. Two samples from a rectilinear stake setting dated as 390-190 BC and 360-175 BC, while a west-east stake alignment proved to be late Iron Age/early Roman. Further along the coast, at Thorness Bay, a longshore stake alignment associated with a hurdle dated to 1060-840 BC. The remains of another hurdle was put between 400-170 BC. A rectilinear stake setting was dated to the Roman period. Beyond Ryde, the sands of Spring Vale have revealed a number of features. The earliest stake alignment dated to the Saxon period and a V shaped fish weir emerged as around AD 1100. A longshore stake alignment suggests a revetment from around the end of the medieval period, dated AD 1420-1610. Dating of a different type of feature involved an excavated pit at Churchill Chine containing charcoal remains: probably a hearth. Samples of the charcoal dated it as a late Neolithic feature. At the same site, a thin, fertile seam was exposed in the cliff face, below the level of the pit. Hazelnut shells extracted from this were carbon dated to around 8400 BC. Part of a group of stakes exposed at Newtown East Spit, now carbon dated to Middle Iron Age.